Clear your calendar - it’s going down on this SATURDAY, APRIL 18TH, from 6pm to 10pm for the ALL BAD DAYS PRESENTS TOGETHER ALONE kick off! Featuring work and IRL fun with Tuesday Bassen, Got a Girl Crush, and Tea Leigh. Hosted by our #1 sister in sadness Jessica Williams of The Daily Show! DJ Sally Jesse Raphael will be spinning some records as you slap on some Tattly tattoos and take the worst/best photo you’ve ever seen of your self in our photo booth! Entering in our $10 raffle gets you two free Brooklyn Brewery beers and a chance to win 1 of 7 prizes including merch from all 4 designers and the chance for 3 people to win a free tattoo session with Tea Leigh! THRONE STUDIOS (29 Wythe Ave in Brooklyn, NY) is our meeting spot for a night of fun and excitement. Come one, come all, bring a guest, and hang loose. 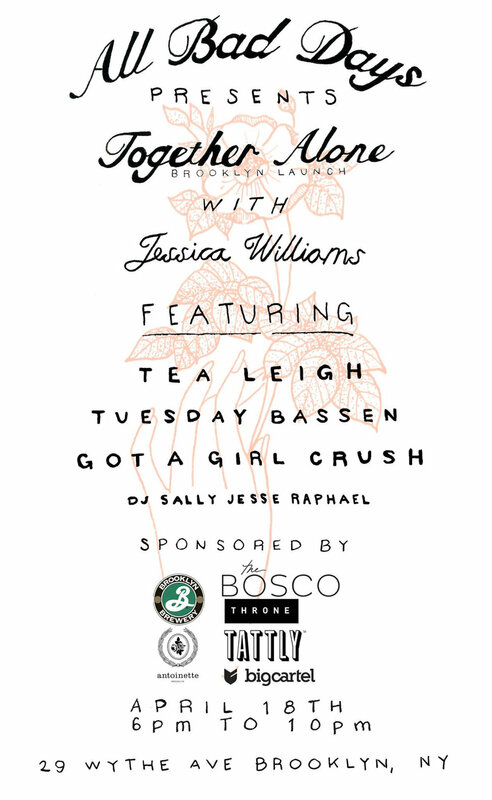 Sponsors Include: Tattly, The Brooklyn Brewery, Bosco, Antoinette Vintage, Throne Watches and Big Cartel. Got a Girl Crush On: The Riot Grrrl Census!